Bridgeview Marina and Resort: Excellent golf courses, beaches for swimming, ship stores for fishing and other boating items. If you are a golf enthusiast, prepare to be amazed by the numerous excellent public and private golf courses in the region, including the region’s newest course, Chickasaw Pointe, which ranked #16 in the 50 best golf courses in America for under $50 green fee. 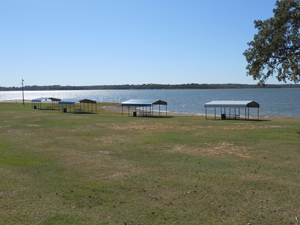 There is always something going on in one of the many communities around Lake Texoma. There is Music on Main Street in Durant, Oklahoma and Sandcastle Building Contests in Pottsboro, Texas. There are boat shows, Magnolia Festivals, fishing tournaments, rodeos and western days, 10k runs and patriotic parades with fireworks on the lake. Is there anything better than laying out on a sandy beach and just doing nothing? Whether you’re working on the perfect tan (don’t forget your sunscreen! ), relaxing under a beach umbrella with the latest John Grisham thriller, or simply enjoy watching the sailboats drift past, the beaches at Lake Texoma are hard to beat. In fact, TexasOutside.com ranked Texoma’s beaches 10 out of 10, and it just doesn’t get any better than that! Maybe you idea of a great day at the beach involves a bit more activity, like swimming, wake boarding, paddle boating or water skiing. Bridgeview Marina and Resort not only offers the beach, but everything you need to make your stay at the beach everything you imagined it could be. Bridgeview Marina and Resort features two ship stores: one on the water and one on the shore! 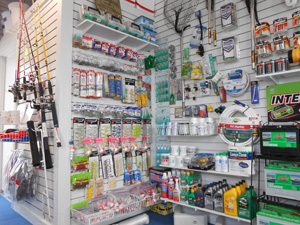 Our ship store one the water is fully stocked with everything you need to keep your boat afloat and your crew happy, including gas, soft drinks, fishing supplies and other boating items. If you need to rent a boat or water toy, the Bridgeview on-the-water ship store is your one-stop shop. Our land-based ship store is attached to the restaurant and serves as a convenience store for campers, boaters and other guests. It carries snack foods, condiments, soft drinks and beer, first aid supplies, sunscreens and sundries that can make your visit just a bit more pleasant. Guests can buy two grades of non-ethanol gas - 87 and 94 octanes. 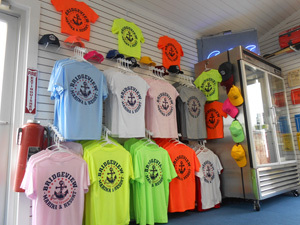 You can also find great Bridgeview Marina & Resort merchandise with our company logo!